vbulletin SMTP Integration | How to Integrate Pepipost With vbulletin? Relying on the PHP internal mail function causes problems with a few configurations for vBulletin. vBulletin supports sending email over SMTP. The SMTP server options can be edited via the Email Options in the vBulletin Options, which will be enabled via the SMTP Email switch. This integration guide includes the process of enabling SMTP for your vBulletin forum. Following these steps will ensure properly delivered emails from your website to users and a high inbox rate. You can turn off the ‘Send to Friend’ feature for individual user groups in the User Permissions area. Allow Users to Email Other Members – Allow users to send emails to other users. Use the option below to determine how the emails are sent. Use Secure Email Sending – If ‘Allow Users to Email Other Members’ is set to ‘Yes’, how should members’ email addresses be displayed? If this is set to ‘Yes’, then an online form must be filled in to send a user an email, hiding the destination email address. Setting ‘No’ will mean that the user is provided an email address and will use their own email client to send the email. Email Flood Check – Specify in seconds how much time must elapse before a user may send consecutive emails. Set to 0 to disable this flood check. Use Mailqueue System – When enabled, subscription emails generated by your site will be processed in batches to lessen the load on your server. Account activation, lost passwords and other vital emails are sent instantly regardless of this setting. If your site has low traffic, subscription emails may be delayed. If you have a large site, you may wish to enable locking. This prevents a rare situation where the same email is sent multiple times. Number of Emails to Send Per Batch – vBulletin includes a mail queuing system to prevent bottlenecks when sending lots of email. Use this option to specify how many emails will be sent per batch. Bounce Email Address – The email address where bounce messages will be directed. If this field is blank, the Webmaster Email address will be used. This email is used when using an SMTP server, or when the ‘Enable -f Parameter’ email for sendmail is switched on. Enable “-f” Parameter – Some sendmail servers may require the “-f” parameter to be sent with email calls from PHP. If you are having problems with users not receiving email, try enabling this option. Likely, your problem will not be caused by this setting. SMTP Email – Set this option to yes to use a SMTP server rather than the internal PHP mail() function. SMTP Port – Please specify the port address. Port can be 25, 587 or 2525. Most of the shared hosting providers block these ports to protect their network from spamming. If your emails are not getting delivered after you complete Set-up, try contacting your hosting provider to unblock a port for outgoing SMTP connection. SMTP Username – Please specify your Pepipost’s username here. 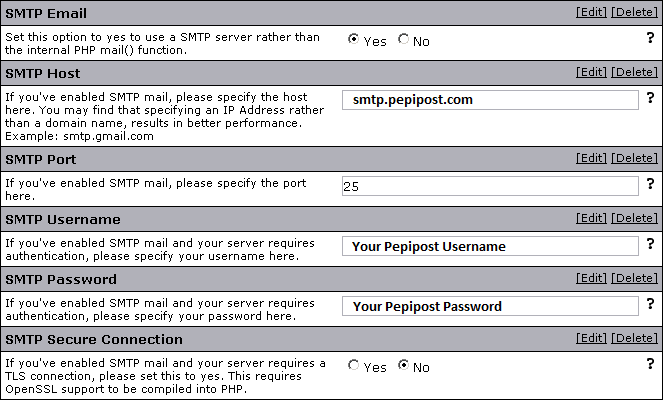 SMTP Password – Please specify your Pepipost’s password here. SMTP Secure Connection – If you’ve enabled SMTP mail and your server requires a TLS connection, please set this to yes. This requires OpenSSL support to be compiled into PHP. To get started you can keep it off.